The olive tree is native to the Mediterranean basin, wild olives were collected by Neolithic peoples as early as the 8th millennium BC. The wild olive tree originated in Asia Minor in modern Turkey. It is not clear when and where olive trees were first domesticated: in Asia Minor in the 6th millennium, along the Levantine coast stretching from the Sinai Peninsula to modern Turkey in the 4th millennium, or somewhere in the Mesopotamian Fertile Crescent in the 3rd millennium. A widespread view exists that the first cultivation took place on the island of Crete. Archeological evidence suggest that olives were being grown in Crete as long ago as 2,500 B.C. The earliest surviving olive oil amphorae date to 3500 BC (Early Minoan times), though the production of olive is assumed to have started before 4000 BC. An alternative view retains that olives were turned into oil by 4500 BC by Canaanites in present day Israel. Homer called it "liquid gold." In ancient Greece, athletes ritually rubbed it all over their bodies. Olive oil has been more than mere food to the peoples of the Mediterranean, it has been medicinal, magical, an endless source of fascination and wonder and the fountain of great wealth and power. Indeed the importance of the olive industry in ancient economies cannot be overstated. The tree is extremely hardy and its useful lifespan can be measured in centuries. Its wide and deep root system ensures its survival without additional watering, even in the water sparse Mediterranean. It thrives close to the sea, where other plants cannot tolerate the increased salt content of underground water. Other than pruning in late spring, it needs minimal cultivation and its fruit matures in the late autumn in the Northern Mediterranean, or through the winter, further south, when other staple food harvests are over and there is no other agricultural work to be done. Olive collecting and processing is relatively straightforward, and needs minimal, mechanical technology. Olive oil, being almost pure fat, is dense in calories yet healthy, without adverse health effects. Unlike cereals which can be destroyed by humidity and pests in storage, olive oil can be very easily stored and will not go rancid for at least a year, unless needlessly exposed to light or extremely hot weather, by which time a fresh harvest will be available. The combination of these factors helped ensure that the olive industry has become the region's most dependable food and cash crop since prehistoric times. Over 5,000 years ago oil was being extracted from olives in the Eastern Mediterranean. In the centuries that followed, olive presses became common, from the Atlantic shore of North Africa to Persia and from the Po Valley to the settlements along the Nile. Olive trees and oil production in the Eastern Mediterranean can be traced to archives of the ancient city state Ebla (2600–2240 BC), which were located on the outskirts of the Syrian city Aleppo. Here some dozen documents dated 2400 BC describe lands of the king and the queen. These belonged to a library of clay tablets perfectly preserved by having been baked in the fire that destroyed the palace. A later source is the frequent mentions of oil in Tanakh. Until 1500 BC, eastern coastal areas of the Mediterranean were most heavily cultivated. Olive trees were certainly cultivated by the Late Minoan period (1500 BC) in Crete, and perhaps as early as the Early Minoan. The cultivation of olive trees in Crete became particularly intense in the post palatial period and played an important role in the island's economy. The Minoans used olive oil in religious ceremonies. The oil became a principal product of the Minoan civilization, where it is thought to have represented wealth. The Minoans put the pulp into settling tanks and, when the oil had risen to the top, drained the water from the bottom. Olive tree growing reached Iberia and Etruscan cities well before the 8th century BC through trade with the Phoenicians and Carthage, then spread into Southern Gaul by the Celtic tribes during the 7th century BC. The first recorded oil extraction is known from the Hebrew Bible and took place during the Exodus from Egypt, during the 13th century BC. During this time, the oil was derived through hand squeezing the berries and stored in special containers under guard of the priests. A commercial mill for non-sacramental use of oil was in use in the tribal Confederation and later in 1000 BC., the fertile crescent, and area consisting of present day Palestine, Lebanon, and Israel. Over 100 olive presses have been found in Tel Miqne (Ekron), where the Biblical Philistines also produced oil. These presses are estimated to have had output of between 1,000 and 3,000 tons of olive oil per season. Olive trees were planted in the entire Mediterranean basin during evolution of the Roman republic and empire. According to the historian Pliny, Italy had "excellent olive oil at reasonable prices" by the first century AD, "the best in the Mediterranean", he maintained, a claim probably disputed by many ancient olive growers. Thus olive oil was very common in Hellene and Latin cuisine. According to Herodotus, Apollodorus, Plutarch, Pausanias, Ovid and more, the city of Athens obtained its name because Athenians considered olive oil essential, preferring the offering of the goddess Athena (an olive tree) over the offering of Poseidon (a spring of salt water gushing out of a cliff). The Spartans were the Hellenes who used oil to rub themselves while exercising in the gymnasia. The practice served to eroticise and highlight the beauty of the male body. From its beginnings early in the seventh century BC, the decorative use of olive oil quickly spread to all of Hellenic city states, together with naked appearance of athletes, and lasted close to a thousand years despite its great expense. Thank you, Rosemary of http://www.sprigsofrosemary.com, for the award. I'm very happy to receive the interesting bloggers award. Thanks again, Rosemary. If you have Christine's Pantry among your link list / blogroll, please let me so I can return the favor. In large skillet, heat extra virgin olive oil over medium high heat. Add kielbasa, cook about 7 minutes, until kielbasa is lightly brown. Using a slotted spoon, remove kielbasa to large pot. Add onions to skillet and chicken stock, scraping up brown bits from kielbasa. Place potatoes in large pot with kielbasa, then carefully add onion and chicken stock to large pot. Add salt and pepper. Stir. Cover and simmer for 12 to 15 minutes, until potatoes are fork tender. Keep an eye on it. Enjoy! I'll bet that tastes great! I don't get to eat much sausage these days except for a brat once in a while. This really makes me crave kielbasa. It's been awhile! Thanks for sharing your recipe. I'm going to save this one. 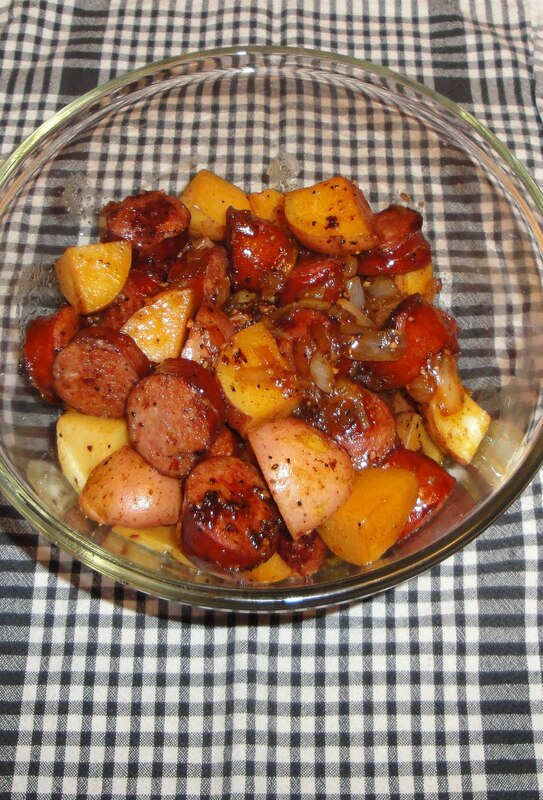 I love kielbasa and I could eat potatoes everyday! looks yummy! I've never had this but would like to try it! This sounds really flavorful. I love stove top dinners, especially when it's so warm out! This looks so yummy Christine. Has a very homey feeling to it. Makes me want to grab a plate and sit by the fire with some music playing. Of course it's already 90+ degrees so I won't actually do that. Lol! Hi Curt, it was very good. My family wanted to know when I was making this again. Hi Michelle, I think you will like this. Thank you! Hi S.V, I could eat potatoes everyday too. And I love sausage. So good. Hi Simple Life, I think you will like this. If you try this let me what you think. Any feedback is always welcome. Hi Cassie, stovetop is the way to go. It's was 109 degrees today. Hi Kim Bee, I know what you mean. Hi Ann, I would love to visit Italy. Looks very good Christine, I haven't had sausage in a while, probably overdue for some. It's warm here too, need to leave the oven off. Hope you are having a great week. Very hearty dish Christine! Sounds delish. the Polish word "kielbasa" drew my attention:) and here is a real fusion-with olive oil! Tasty recipe! Thanks for sharing the great background information. I really like this dish, easy and a great comfort food. Thanks for posting-yum! You always have such interesting posts! The olives and olive oil in Crete were some of the best I have ever tasted. 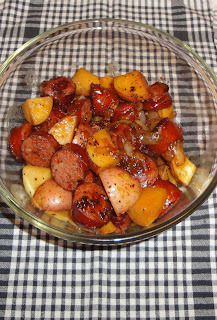 And your kielbasa recipe looks dreamy! I love the history that you include. That dish looks very tastey. Thank you for sharing. Hi Diane, you can use any smoked sausage. Use your favorite sausage. Welcome! We are happy to have you here. Pull up a chair, sit down and get comfortable. We would like to know you better. We always have kielbasa on hand so this should be a cinch to pull together. Hi Christine!!! I've never tried kielbasa. I'm impressed by the history of the food you write every post... Keep up the great work!!! Never had kielbas before...now I am totally intrigued! Great dish! I love how easy it is to put together. potato and sausage is a savory combo....!